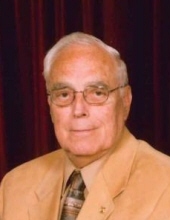 Tomlinson, John Dana, Jr., age 91 of Oakland Township, passed away February 9, 2019. Loving husband of the late Nancy. Dear father of James Tomlinson, Mark Tomlinson, Mike (Adrianne) Tomlinson and the late John Dana Tomlinson III. Cherished grandfather of Alexandra (Ryan) English and Melanie Coak-Tomlinson. Great grandfather of Rocco English. John was a WWII Navy Veteran, member of the Stony Creek Masonic Lodge #5 and Sons of the American Revolution. "Email Address" would like to share the life celebration of John Dana Tomlinson, Jr. Click on the "link" to go to share a favorite memory or leave a condolence message for the family.